This was a tasty thrifty way to eat vegetarian this week. I’m often wary of meat replacements because they just never taste that great to me, but we all liked this recipe. It’s super cheap to make, about 3-4 dollars a pan which breaks down into 4 meal sized servings and you can freeze it for later use. I think I finally found a way to enjoy green lentils! 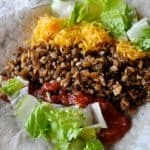 This is a delicious non processed, whole foods, meat replacement and I’m happy to add it to my arsenal of vegetarian recipes worth keeping. I amended my original post to add a note about salt, I used a homemade version of montreal steak seasoning without salt. I added some salt and then added more as needed after baking it for a while. This sounds good (although extremely high in salt). I'll have to check and see if they make a lower sodium steak seasoning. Thanks for sharing. Hi! this is my first time linking over here. hope you like my recipe, its very quick and easy to make. Hi, thanks for featuring the recipe. I like the addition of the smoked paprika, I will have to try that. There's not really much salt. I actually only added what's in the steak seasoning to mine, didn't add extra and it was great as is. I like the sound of those meat replacements Laura – they sound delicious. Thank you so much for hosting Just Another Meatless Monday. Have a great week! By the way, I'm almost certain I have seen a low salt version of Montreal Steak Seasoning on the grocery store shelves recently when I've been visiting North America. Oh we absolutely loved your veggie patties, so I'll have to try this meat substitute too! 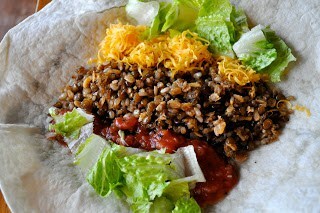 I love love love that you put it in burritos, that looks so delicious! Don't EVER buy the Montreal Steak Seasoning from the Dollar Tree. It is effing NASTAY. Ruined a whole crock pot of food using it. Bleck. I'm sharing an oldie but goodie this week! We eat it at least twice a month. It's cheap, easy, quick, and I always have rice and a can of beans on hand! Thanks for hosting this blog hop, looks like lots of good recipes to try. I just wanted to tell you I've had this bookmarked for quite awhile now and finally made it yesterday. It was great! The husband even ate it, which means this is a total keeper.